So back in May I went to the Brussels Jazz Marathon, via the Eurostar. As it was only £5 more for Standard Premier than Standard, I of course took the obvious action! Free drinks, some food, more space – an easy choice! As in my previous post, I had access to the lounge via my American Express Platinum, providing a nice start to the journey! The Standard Premier cabin is actually the same cabin as Business Premier, but with different service. The layout 1+2 seating, with some stand alone, and some facing seats with a table in the middle. This gives more space than standard (8cm width, and an additional 10cm legroom to be precise), in a 2+2 layout. Most, but not all, seats had power, but only a European plug, not UK or US. The Eurostar website says both types of power are available, and at all seats. However, this wasn’t the case on this service! Thankfully the train wasn’t very busy, so everyone who wanted power managed to move around to get it. The service on the way out was a continental breakfast, with croissant, baguette and a pain au chocolate, with coffee, juice and water. For this return journey, we were served a choice of a cheese plate or a chicken salad, with a chocolate and raspberry mouse as a dessert. Nothing ‘wow’, but perfectly adequate for a light lunch. And of course free wine with lunch (not breakfast!). Although I only had the one bottle (187ml), the couple behind me had several extra bottles during the journey, all for free. I didn’t make a note of the wine, but it was a fairly cheap French table wine, but drinkable. Now £5 more isn’t always the case – it can cost £50-60 more per leg I believe from the cheapest Standard fares available to the most expensive Standard Premier. 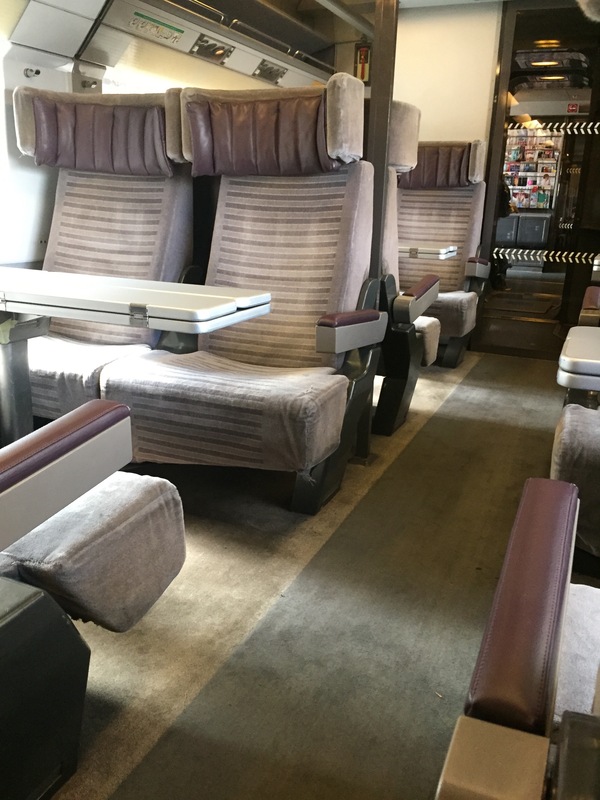 I do value space when travelling, and would be willing to spend a few extra pounds here – perhaps not a whole £50 though, as Eurostar’s standard cabin is still very comfortable and better than most UK domestic trains. Of course you can buy a light lunch and quite a few drinks for £50 from the buffet car. However, if you are getting a long journey all the way to the South of France, then the extra space is a no brainer for me.